A colorful and healthy dish for Easter! I love the way the house smells when I'm roasting sweet potatoes. Especially when I toss them with pumpkin pie spices! If you are still looking for ideas for Easter dinner, try these colorful roasted potatoes on a bed of broccoli! Sweet potatoes are one of the absolute best sources of beta-carotene which the body converts to vitamin A. Although sweet potatoes are themselves fat free, you should eat them with a little fat so that your body can better absorb the beta-carotene. The touch of oil in the broccoli should do the trick! Cut the sweet potatoes into small pieces about 1/2 inch by 1 1/2 inches. Place them in a large bowl with the diced onion, oil, pumpkin pie spice and salt. Mix until well coated and spread out in one layer in the prepared roasting pan. Seasoned potatoes and onions in a roasting pan. Bake until lightly browned and fork tender, about 30 minutes, turning after about 15 minutes. While the potatoes are roasting, cook the broccoli. Place florets in a steamer and cook for several minutes. If you cook them too long, they will fall apart when you dress them so just steam briefly but don't leave them so hard that you can't get a fork through them. In a large bowl, combine the oil and lemon juice. Place the cooked broccoli in the bowl with the dressing. Salt to taste and toss gently until coated. Place the broccoli around the edges of a serving dish. Removed cooked sweet potatoes from the oven. Place them in the center of the serving dish. place roasted sweet potatoes in the center. Per serving of sweet potatoes (6 servings): 132 calories, 3 g fat, 0 g saturated fat, 25 mg omega-3 and 310 g omega-6 fatty acids, 0 mg cholesterol, 2 g protein, 25 g carbohydrates, 4 g dietary fiber and 159 mg sodium. Per serving of broccoli (6 servings): 55 calories, 2.5 g fat, 0 g saturated fat, 355 mg omega-3 and 1,351 mg omega-6 fatty acids, 0 mg cholesterol, 3 g protein, 7 g carbohydrates, 3 g dietary fiber and 130 mg sodium. I'm not a proponent of a 100% raw food diet, but I do believe having adequate amounts of raw food in your diet is extremely important for good health. In the winter, we crave warm, cooked foods but I still try to eat at least a third of my food raw. Now that spring is here (I realize some of you are still getting some nasty weather but hang in there, it will come soon! 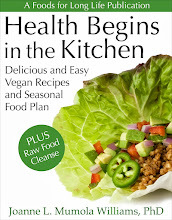 ), it's time to up our intake of raw food. I aim for about 50% in the spring. Raw foods are rich in phytochemicals, many of which are destroyed by cooking (except for some carotenoids). Vitamin C and essential fatty acids are also heat sensitive and are better consumed in raw foods. And although there is some debate as to the significance of their contribution to human digestion, raw foods are alive and rich with enzymes. Salads made with fruits, nuts and seeds are a great way to add raw food to the diet. They can be part of any meal or enjoyed as a dessert. Today I'm making a Mexican papaya salad with a few strawberries tossed in a simple poppy seed dressing. This recipe is suitable for a Raw Food Cleanse. Mexican papaya are a deeper orange than the ones we get from Hawaii and can be much larger. Besides being a very good source of vitamin C, vitamin A and folate and other vitamins and minerals, they contain papain, an enzyme that aids in digestion. Papaya is also high in dietary fiber. And don't throw out the seeds - they make a nice, peppery salad dressing. Check out Raw Fruit and Greens with Papaya Seed Dressings and 10 Interesting Things to Know about Papaya. Place papaya and strawberries in a medium size bowl. In a small bowl or cup, mix together the lime juice, agave nectar and poppy seeds until well incorporated. Pour over the fruit and toss gently until combined. Serve immediately. Per serving: 78 calories, 0.5 g total fat, 0 g saturated fat, 48 g omega-3 and 128 g omega-6 fatty acids, 0 mg cholesterol, 1 g protein, 20 g carbohydrates, 3 g dietary fiber and 5 mg of sodium. Brussels sprouts have numerous health benefits! Delicious, Healthy and one of my Favorites! I adore Brussels sprouts. They are a family favorite. Even my husband, who resisted them when we first got married, has grown to love them. They are not only delicious, but they have numerous health benefits! What's not to like? Brussels sprouts have one of the highest glucosinolate contents of all the cruciferous vegetables which means they help us fight cancer. Other healthy cruciferous vegetables that have these cancer-fighting properties include broccoli, kale, cabbage, mustard and turnip greens as well as cauliflower. 1 cup of Brussels sprouts has only 38 calories. They are high in fiber and very low in fat. Brussels sprouts are a very good source of vitamins A,C & K, B6, folate, potassium and manganese. The slow cooking of onions, carrots and celery, to add rich flavor and aromatics to your dish, is call soffritto in Italian cuisine. Soffritto comes from the Italian verb, "soffriggere" which means "to fry slowly". In French cuisine, the combination of these vegetables is called mirepoix. Italians generally use olive oil while the French typically use butter to cook the vegetables. And, of course, Italians often toss in some garlic too. Most soffritto recipes call for more oil and a longer cooking time but I use a modest amount of oil, and a shorter cooking time. Soffritto or Mirepoix is a combination of onions, carrots and celery. Italians often add garlic to the mix. They should be diced a bit smaller than this but I was lazy! Make vegetable broth by dissolving the bouillon cube in the hot water and set aside. Heat the oil in a 5-quart Dutch oven and add the onion, carrot, celery, garlic salt and pepper. Cook on low heat, stirring occasionally, until the vegetables soften and brown slightly, about 8 to 10 minutes or longer. Make the "soffritto" or "mirepoix"
Add the wine and cook for another 2 to 5 minutes. Stir in the thyme and Brussels sprouts to coat. Add the vegetable broth and stir to combine. Bring to a boil. Reduce the heat to medium and cook, covered, on a medium simmer until the Brussels sprouts reach the desired tenderness, about 8 to 10 minutes. Remove the cover and turn up the heat to reduce the broth, stirring occasionally, about 5 minutes. Per serving: 78 calories, 5 g total fat, 2 g saturated fat, 94 mg omega-3 and 282 mg omega-6 fatty acids, 0 mg cholesterol, 4 g protein, 10 g carbohydrates, 4 g dietary fiber and 373 mg sodium. Vegan Corned Beef And Cabbage With Seitan Or Gluten Free Soy Curls - Perfect For St. Patrick's Day! 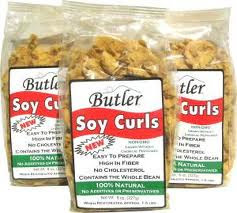 Soy curls are used for gluten-free corned beef and cabbage. Corned beef and cabbage is a pretty healthy dish, except for the corned beef. Each three ounce serving of cooked corned beef is 213 calories, 16 grams of fat, 5 grams of saturated fat and 83 mg of cholesterol, 0 carbohydrates and 0 fiber. It is, of course, a source of protein (15 grams per 3 ounce serving). But you can get protein without the fat and a lot fewer calories when you substitute corned beef with seitan (a vegan meat substitute made from wheat gluten) or Butler's soy curls (a gluten-free, vegan meat substitute made from minimally processed soy). In fact, ounce per ounce, seitan has even more protein than corned beef! No Food Coloring in This Dish! You'll probably be getting enough food coloring today in your beer so to make the "meat" in this recipe that reddish, corned beef color, I soaked the seitan and soy curls in beet juice and pickling spices. If you want your "meat" to be reddish, you will be dying them in natural beet juice. To prepare the beet juice, place the beets in a medium saucepan and cover with about 3 to 4 cups of water. Add salt, cover and cook until the beets are tender. Remove the beets and set aside for a little salad (see below). Boil beets for food coloring. Remove beets and save the liquid. Keep the remaining beet water in the saucepan. Add 1 tablespoon of pickling spice, (reserving 1 teaspoon for the vegetables), and simmer, covered, for 10 minutes. Soak seitan or soy curls in the hot, spiced beet water and set aside until needed. Heat the Earth Balance in a 5 quart Dutch oven. Cook the onions until soft, about 5 minutes. Stir in the carrots, cabbage and 1 teaspoon of pickling spice. Cover with 3 cups of broth and cook, covered, stirring occasionally, until the cabbage wilts, about 15 minutes. Stir in the potatoes. Sprinkle with salt and pepper to taste. If it looks like the pot needs more liquid, add another cup of water or broth. Cover and cook until the potatoes are tender but not overcooked, about 15 to 20 minutes. The seitan is ready to serve. Place the vegetables in a plate and top with the seitan. If using soy curls, drain them well and cook them in a slightly greased hot skillet for several minutes until they begin to brown. Serve with the vegetables. Heat 2 to 3 cups of water and 1 tablespoon of pickling spice. Soak the seitan and soy curls in the hot, spiced water, omitting the beets. About those leftover beets. Toss with a bit of apple cider vinegar and hemp (or extra virgin olive) oil. Salt and pepper to taste and enjoy! A simple stir fry with fresh asparagus and shiitake mushrooms. Doug and I love asparagus whether it's raw, roasted or in a simple stir fry. This week they appeared in all of our favorite grocery stores. We've already made them twice in the past few days and have more in the refrigerator! These lovely green spears are packed with vitamins and minerals as well as protein and dietary fiber - perfect for a low calorie, high fiber diet! protein, dietary fiber, vitamin A, C, E, K, Thiamin, Riboflavin, Niacin, B6, Folate, Iron, Phosphorus, Potassium, Copper and Manganese. Bend the bottoms of the asparagus spears until they snap off. Rinse well or soak in cold water. Drain and cut into 1 1/2 inch pieces and set aside. Stir cornstarch into the water until it is completely dissolved. Mix in the lemon juice and soy sauce. Set aside. Heat oil in a non-stick wok or large frying pan. Cook onion for a minute stirring until separated. Add garlic, ginger and black pepper and cook until fragrant, about a minute. Add shiitake mushrooms and cook, stirring frequently, until they soften, about 3 minutes. Stir in asparagus and cook until they are fork tender. Stir the cornstarch mixture again since some of it may have settled to the bottom. Pour into the hot wok and cook until the sauce thickens and coats the vegetables. Serve as a side dish or over cooked brown rice. If you are serving with either buckwheat or gluten free rice noodles, you may stir cooked and rinsed noodles into the wok when the sauce begins to thicken. Per serving (without rice or noodles): 93 calories, 3 g total fat, 0.5 g saturated fat, 25 mg omega-3 and 1,461 mg omega-6 fatty acids, 0 mg cholesterol, 5 g protein, 13 g carbohydrates, 4 g dietary fiber and 240 mg sodium. Spaghetti makes a fun stuffing for fiber packed eggplants! I've been wanting to do something with eggplant lately so I decided to stuff them. Most stuffed eggplant recipes use chopped meat or breadcrumbs. I thought, "wouldn't it be fun to stuff them with spaghetti"? This purple beauty is packed with fiber and is an excellent source of manganese, potassium, folate and a host of other vitamins and minerals. They do belong to the nightshade family of vegetables so some people avoid them. Being Italian, it's impossible for me to avoid nightshade vegetables which include tomatoes and peppers - how could I possibly cook without these wonderful vegetables? But some people are sensitive to the alkaloid solanine, contained in nightshades, which can aggravate joint pain in a small number of people. Although these eggplants are organic, you can buy conventional with safety as eggplants are part of the "Clean 15" and are grown with very little pesticides. Preheat oven to 350 degrees. Lightly grease the 9"x13" baking dish and set aside. Prepare the eggplant. With a sharp knife, score the eggplant 1/2 inch from the edge. Be careful not to penetrate the bottom of the eggplant. With a spoon, scoop out the pulp leaving enough eggplant to provide structure. Save 4 cups of pulp, discarding any with too many seeds. Place hollowed out eggplant, hollow side down, in a large pot on a steamer basket. Cover and steam briefly until they begin to soften, about 3 minutes. Don't cook too long or they will lose their shape and be difficult to stuff. Carefully remove the eggplant shells and drain on a paper towel. Break the spaghetti in half. Using the smaller, 3 quart saucepan, prepare the spaghetti according to manufactures instructions. Cook "al dente". For gluten free, use brown rice or quinoa spaghetti. Chop the eggplant pulp into 1/2 inch cubes and place in the 3 quart saucepan with a half cup of water, black pepper, dried basil and salt. Bring to a boil on high heat. Lower the heat, cover and simmer until eggplant softens, about 5 minutes. Remove the cover and cook until most of the moisture has evaporated. Cook eggplant pulp until soft and dry. Heat the olive oil in the large pot. Add the onions and cook until they soften, 5 minutes. Add the garlic and cook until fragrant, another minute. Crumble the tofu and add to the onions. Cook several minutes, stirring constantly. Turn off the heat and stir in the ground flax and nutritional yeast until well combined. Add spaghetti and most of the mozzarella shreds, reserving 1 or 2 tablespoons for topping. Adjust salt and pepper if needed. Place the eggplant shells in the baking dish and stuff each with 1/4th of the mixture. Cover with marinara and sprinkle with the remaining daiya mozzarella shreds. Cover with foil making sure the foil does not touch the eggplant. Bake for 25 minutes. Remove the foil and bake another 5 minutes. Remove from the oven and serve. Each eggplant half is one serving. A single serving provides 15 grams of fiber! Per serving (made with whole wheat pasta): 326 calories, 11 g of total fat, 2 g saturated fat, 568 mg omega-3 fatty acid*, 1,677 mg omega-6 fatty acid*, 0 mg cholesterol, 15 g protein, 49 g carbohydrates, 15 g dietary fiber and 624 mg sodium. Per serving (made with gluten free brown rice pasta): 336 calories, 12 g of total fat, 2 g saturated fat, 561 mg omega-3 fatty acid*, 1526 g omega-6 fatty acid*, 0 mg cholesterol, 13 g protein, 49 g carbohydrates, 13 g dietary fiber and 629 mg sodium. * This does not include any contribution for omega-3 or omega-6 fatty acids from daiya mozzarella shreds, nutritional yeast or the gluten free pasta since that information was not available from the manufacturer.